Population explosion of these things . 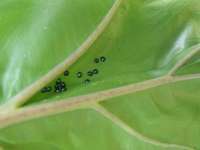 They seem to be eating holes in the plants , a nearby Costus is severly affected . All the new growth in the rainforest after the recent Cyclone has upset the natural balance . I am always hesitant to spray , and when I do only use pyretherum or similar contact spray . Try Orange oil in slight concentrations with a small amount of soap added. greenhouse to kill off all the white fly at once . kills on contact . it's Non-toxic in the deluded form . best ant killer I've ever found ..
ants/queens are history in short order THE BEST PART ! Smells great . discovered. It is marketed as Merit and Marathon, among others. John. Please elaborate on the concentration that you use for insect control. You say to use 50/25 to on spray bottle. Are you refering to Zep/water. meally and would love to hear your experience with this product. added. I use Zep Citrus cleaner & degreaser concentrate @ Home Depot . the rainforest after the recent Cyclone has upset the natural balance . up everywhere I go ! say to use 50/25 to on spray bottle. Are you refering to Zep/water. to hear your experience with this product. the greenhouse smells like oranges after I'm done .